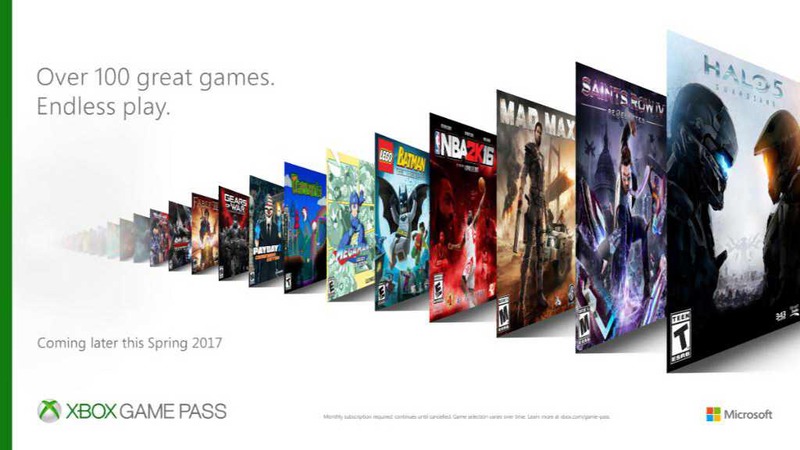 Microsoft today announced Xbox Game Pass, a new subscription service with unlimited access to more than 100 games. The new gaming subscription service coming later this spring alongside Project Scorpio console. With $9.99 per month, you will get unlimited access to over 100 Xbox One and backward compatible Xbox 360 games. One of the best things about Xbox Game Pass is that you can discover and download the full titles directly on your Xbox One. That means continuous, full-fidelity gameplay without having to worry about streaming, bandwidth or connectivity issues. In addition, all Xbox One games in the catalog – and related add-ons – will be available to purchase at an exclusive discount for Xbox Game Pass members, so you can make the games you love part of your permanent library to play whenever you want. Every month new games will cycle into the subscription with some cycling out, giving you a constantly updating library of games. Microsoft will test Xbox Game Pass with select members of the Xbox Insider Program in the Alpha Preview ring with a very limited number of titles. Xbox Live Gold members will also be receiving exclusive access to Xbox Game Pass prior to the program launching to the broader community.